It is now more easy to buy or sell a second hand glass machine than you think. Just contact us. At the present time, the main problem of the every company who to be interested in glass processing, center and cutting is nonexistence of technical support service and spare parts of bought machines in following years. Especially, finding spare parts can be real trouble. Because of the these reasons, Glass Machine has made a great decision. 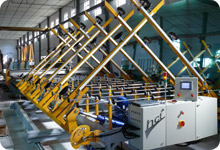 According to this decision, Glass Machine is starting to serve customers giving them techical support service and also providing spare parts of almost every machines such as; Butly Extruder, Slikajel, Thiokol Extruder, Rotating Table, Hotmelt Extruder, Desiccant Filling Machine, Glass Washing Machines, Glass Cutting Machines (Cutting Line, Manuel Cutting, Semi-Automatic Glass Cutting), Glass Center Machine, Glass Tempering, Glass Carring Unit. In addition to our service, we are suppling extra material to our customers. Usage and mounting of spare parts are just one of them. Moreover, twenty four hour phone call or online support is the best way to answer this question “how can we find out these problems”. Periodical Maintence Covenant is our extra service. Among the all of things, we adopt an approach which is focused on customer satisfaction and proactive in responding to customers' needs and demands in an appropriate and timely manner. This is our the most important duty and we know that. Software; Optimization programs for glass cutting machines and manuel glass cutting (Perfect Cut Suite Glass Cutting Program), NC, PLC software for all glass machines and process sequences software for all unit (cutting, grinding etc. ).